We all have come across people delivering speeches at the grand openings, the national festivals like the Independence Day and the Republic Day but very rarely do we feel that the person is “speaking”. My age old search for an impactful speech finally came to an end. All thanks to PILF (Pune International Literary Festival) and me (for being able to find time, out of my busy schedule).For those who aren’t aware of PILF, The Pune International Literary Festival (PILF) is an annual, literary festival organized in Pune. This year’s theme was very much welcoming! What better than a social theme for children, “Children’s Rights” with a tag line of “Because every child is special”. The lit-festival is a great event which brings together authors, entrepreneurs and a lot of young and old intellectual minds together. PILF comprises of everything essential to grab the attention of a thoughtful mind craving for something good. Colorful and attractive are the two best words to describe about the organization of the event. There were as many as 120 speakers at the event for 2016 with notable personalities like Narayana Murthy, Anupam Kher, Rajdeep Sardesai and Shobhaa De to name a few. It is a common practice to have the most awaited event to conclude any program. This time around it was, “‘Yours Truly Anupam Kher’ (Kuchh Bhi Ho Sakta Hai) Ashok Chopra in conversation with Anupam Kher”. 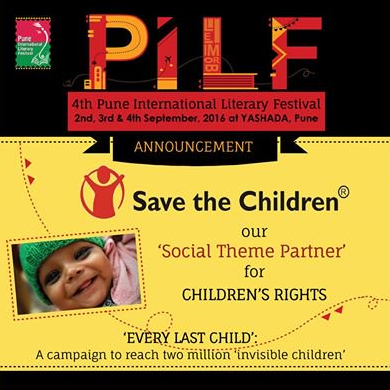 For all the obvious reasons many of them were awaiting this and many even registered for PILF just so that they can attend this event. Over 100 plays and 500 films stand testament to this eternal optimism that gave rise to the drive and passion that catapulted Padma Bhushan award-winning actor Anupam Kher to the heights of being considered one of the greatest actors of contemporary cinema. They wanted to know about his stand as a writer, as a person and as someone who captures many minds as a nationalist and a proud Indian. It’s a case of student syndrome that we all look at the time when we are seated in a session or a discussion or a gathering immediately followed by a glance at the EXIT sign. Interestingly, Anupam Kher turned out to be one of those personalities who failed to divert my mind to thinking of when the EXIT sign boards turn RED and the doors open! He kept my ears willing for more. Successful as he is as an actor, he turned to writing with his first book launch “The Best Thing about You Is You!“ in 2011. Contrary to his acting career, his literary career took a different and better direction with the very first work of his as it went on to become one of the best sellers. The book is all about examples from his life and experiences. The best way to counter the negativity that exists in the world these days, where people are gripped by fear, insecurity, stress, frustration and unhappiness is by acquiring a positive outlook. His words motivate and inspire you by providing a handy guide to discovering your real self in today’s chaotic times. Like the transition of his life from being a star to a writer and a nationalist and what not, the conversation with him also turned pages, starting from his black and white days to his golden days to today. He gave a lot of his experiences about his struggle for the film industry as well as towards being able to make himself what he is today. The reason I got so awed was because I had no idea when it turned into something called as the fraternity and integrity driven one. One fine moment, he suddenly diverted to telling people how beautiful our country is and how we can make it an even better one and how one should deal with all of this along with the intolerance issues. He made me believe for those 75 minutes that yes, I am at the best place of my life being here in India, and I will continue to make this place a better one. While re-visiting those moments of his struggling days, he often referred to a statement by his Grandfather, “If you don’t expect anything from someone (be it the king or a nation’s prime minister) then you are equal” and how this helped him change the course of his life. How true is that statement? In the daily chores of life we often come across situations where in we find ourselves at the bottom of the pile, thinking about the society, the people and the country. What if I just stop expecting from all of these entities and do my bit. Yes, I will make a difference not just to my country but tremendously to my own self. Another statement which grabbed my attention and made me consider for the rest of my life too is, “I have never said two words in my entire life, ‘I am bored’ and ‘I am not in the mood for it’ (Aaj mood nahi hai)”. Isn’t it mesmerizing? Had I also not said or felt these emotions in my life, I would have utilized my life for doing some more notable things. Just a day back when I was returning from a visit to Mumbai, 6 cars rammed into each other forming an unwanted train bogie and unfortunately ours was one among them. Minutes after the incident, a police van went past us giving those ill looking faces. Isn’t it the duty of police to sort matters inflicted on the roads? Isn’t it a moral responsibility of them to at least enquire how is everybody doing? Such are the times when you feel the entire world is full of such people and it’s not worth struggling for. But the moment I was back and thought about Anupam Kher’s speech I was back in gear! The goosebumps I got every time he said India is a great country if we learn how to respect it, if we know how to nurture it and if we know how to value it, were similar to the once we get while we sing our anthem! He was that effective during his conversation. I believe there are people who are struggling to make this country better. There are people like me. There are people like you. There are people who utilize their life in the right direction. It’s not always true that, a few rotten mangoes spoil the entire lot. When asked by a journalist, “What would be your message for the youngsters?” He proudly said, “Today’s youngsters are knowledgeable, sensible and share a sense of responsibility for the nation. I don’t have to tell them anything. A few hundred unwanted people would not change the way I look at my nation”. Today we are in dire need of such influential gatherings. There would always be people who wouldn’t give a damn or make fun of this behind my back but let’s not forget there are people who would have seen a ray of hope for the country after listening to me. I have started to believe in my dream of a better nation more than ever before. Previous Post It Is All About YOU..